A USGA handicap index for a player may be calculated from within the 'Edit Players' screen. Note: Despite using the approach published by the USGA, the handicap index calculated should not be considered as official and should be used as a guide only. At least 5 valid 18-hole rounds must have been recorded in order to calculate a USGA handicap index. These rounds must also have been played on tees for which the Course Rating and Slope Rating has been entered. A maximum of the 20 most recent rounds may be included in the calculation. Click the appropriate button on the 'Edit Players' screen and a screen will displayed showing the valid rounds recorded for the player. 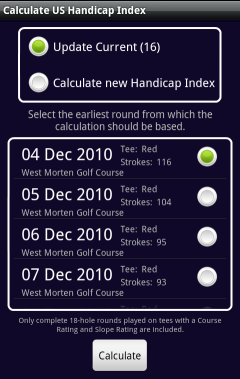 From the rounds displayed on screen, the first round to be included in the calculation should be selected. For example, if 10 rounds are displayed but the player requires that the calculation be based off of the most recent 5 rounds only then the radio button against the 6th round should be selected. For a calculation to be possible, at least 4 valid rounds following the selected round must be available (5 rounds in total). 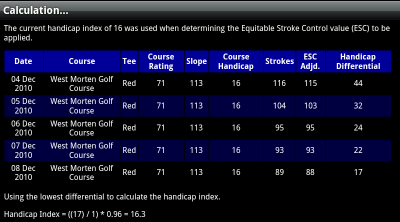 The difference between performing an update to the existing handicap index for the player and calculating a completely new value, relates to the handicap index used to determine Equitable Stroke Control limits to be applied to the stroke counts for the holes played. When calculating a new handicap index, the default values of 36.4 for men and 40.4 for women are used to determine the ESC limit to be applied. Following the calculation of a handicap, it is possible to view the steps taken to achieve the result. The Adjusted Gross Score (shown on screen as ESC Adjd.) is the total number of strokes for a round following the application of Equitable Stroke Control (ESC) to the hole scores. ESC sets a maximum value that may be recorded against each hole and is dependant upon the player's course handicap (which in turn is dependant upon their current handicap index and the slope rating of the tee being played). For players without a current handicap index, the default values of 36.4 for men and 40.4 for women are used to determine the ESC limit. Finally, a subset of the calculated differentials is used to calculate the handicap index. This subset contains the best (i.e. lowest) differentials, with the size of the subset dictated by the number of rounds that have been included in the overall calculation. The handicap index is calculated as the average for all differentials in the subset, multiplied by 0.96 and then truncated to 1 digit after the decimal point.